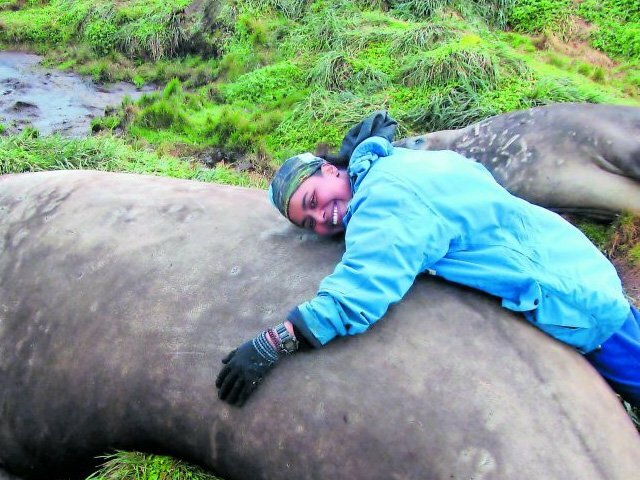 “I am a proudly South African fierce environmental steward, always up for an adventure to the mountaintops or ocean depths,” says conservation officer Nasreen Khan. Khan lives with nine other people on a conservation island reserve in the Seychelles run by the Island Conservation Society and is tasked to look after its biodiversity. She works with animals like seabirds, turtles and seals to produce scientific data to assist in preserving endangered species and fragile island ecosystems. Inspired by adventurers in her parents’ vintage National Geographic and Readers Digest magazines and the 1990s animation Captain Planet, Khan dreamed of a career in marine biology. Her school guidance counsellor told her she had no direction in life and wondered how she would survive on a career “looking at fish”. Khan’s parents, anti-apartheid activists from Ladysmith, KwaZulu-Natal, nudged her toward conservation and environmental activism and she later joined Greenpeace. As an eco-activist coordinating the Greenpeace urban group between 2012 and early 2016, she focused on all types of enviro-education and training, particularly on becoming energy autonomous with solar power. As part of the team at the Council for Scientific and Industrial Research, she researched mercury in fish and helped educate South Africans on the safe meal limits for weekly fish consumption. Khan has also been on numerous life-changing expeditions. She spent time at the South African scientific research station on Marion Island, an uninhabited island located in the sub-Antarctic. Along with 19 other people she spent over a year isolated from the rest of the world to collect data in extremely harsh conditions. “The elements and the land chisel you down to your very core, and flaunt your worst fears in front of you,” Khan says. She collected valuable data and worked with killer whales, elephant seals, fur seals and endangered seabirds. Given the opportunity to name two killer whales, Khan named them Ayesha, from Guardians of the Galaxy, and Shah Khan, after the Bengal tiger from The Jungle Book. Those also happen to be the names of her parents. Aboard the South African ship, Mama Afrika, her last expedition was to the Antarctic marginal ice zone where she worked for BirdLife South Africa and the department of environmental affairs oceans and coasts department to monitor and classify seabirds and mammals at sea, toward the end of the Southern Ocean.